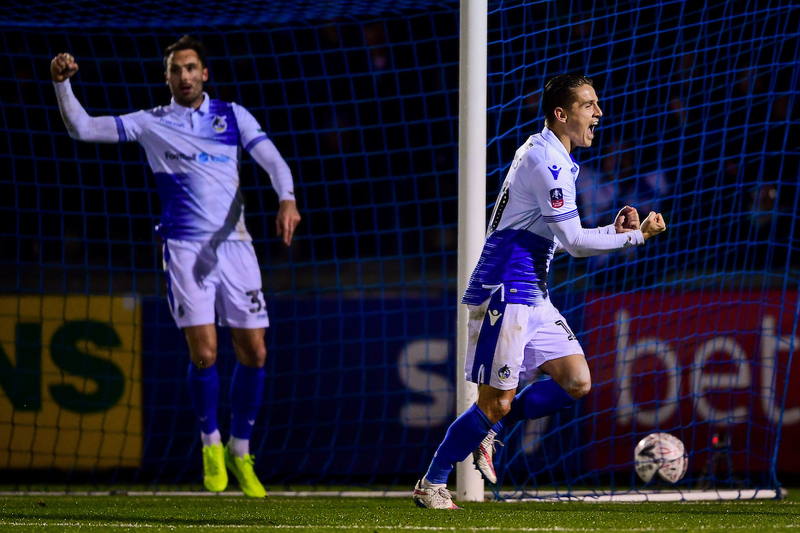 Rovers were dumped out of the FA Cup by Barnet on Wednesday night, despite taking the lead in the 61st minute through Tom Nichols’ drought-ending goal. As the case so often at the Mem this season, the game was level at the break despite numerous “almosts” for Rovers; the most prominent coming in the 10th minute when Kyle Bennett hit the post. Just past the hour mark the intense pressure paid dividends when Nichols helped home Bennett’s low drive to get back amongst the goals after a long period without – perhaps the only positive to take from a bleak night. 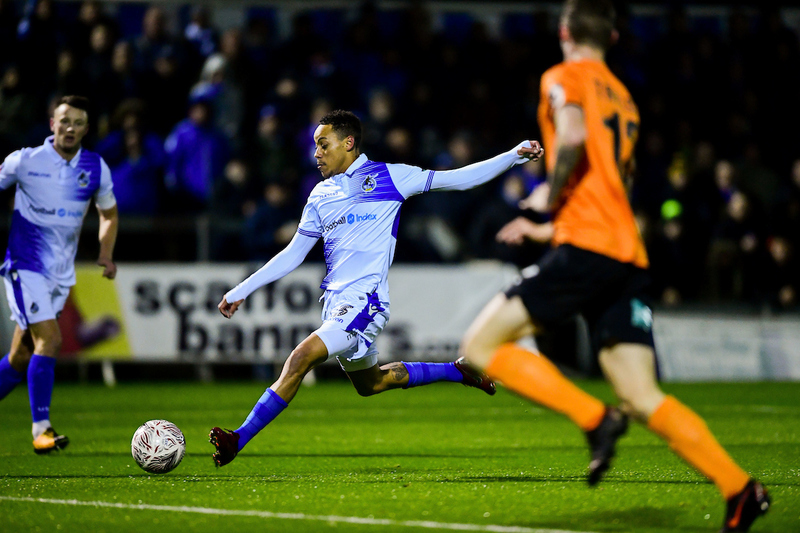 Barnet spoiled the party and turned the replay around with a quickfire double from Craig Robson and Byron Harrison to send Rovers crashing out of the competition. Going into the game, Darrell Clarke made five changes to the side that hosted Scunthorpe United at the Mem last weekend. Loanees Jack Bonham and Joe Martin are ineligible to play in this competition for Rovers, therefore in came Adam Smith and Michael Kelly. Joe Partington also returned to the defence, with Ed Upson featuring in midfield whilst Alex Rodman made his first start since the 1-0 loss at Burton Albion in October. It was the 31-year old winger who was heavily involved in the early stages, seemingly keen to impress following a stop-start opening to his Gas career, notably a driving run, just inside Barnet’s half, past a handful of orange shirts and all the way to the edge of the area but the shot that followed was slightly skewed. 10 minutes had passed and it was also Rovers to this point; Liam Sercombe looked to build on his first of the season against Scunthorpe as he drove a well-hit shot from a similar position but was foiled by a strong block. The hosts were knocking and on 11 minutes, Bennett rattled the same post he had done just four days ago with a lovely flowing move culminating in a cute cut back by Nichols to Bennett who leathered the ball goalwards but saw it bounce back out off the upright. Nichols again provided an ideal lay off for a teammate, this time it was Ollie Clarke but the evening’s skipper sliced his shot with Rodman forcing a decent stop from Mark Cousins on the rebound. The striker was amongst the action again just before the half-hour mark, as he followed up O.Clarke’s deflected shot and had the goal at his mercy but he was hauled to the ground by the scrambling keeper – the referee took a long pause but decided against awarding a penalty much to the perplexment and frustration to Nichols and co.
A slight lull followed from Rovers’ perspective as they surrendered a portion of possession to the visitors for a brief spell, but looked to finish the half strongly with Sercombe once more issuing a warning with a testing long-range strike that forced Cousins into a smart stop down to his left. Barnet came out brightly and the referee had some more officiating to do in the box Nichols had gone down in as Josh Walker raced into the box and went to ground with Tony Craig nearest, who was clearly unimpressed with the winger’s ease of fall as the referee waved it away. Rovers first notable chance of the half came not soon after that incident with Bennett clipping a lovely ball to the back post that Rodman rose to meet, but he could only send his header wide. Just before the hour mark, D.Clarke made his first change, a double switch with Daniel Leadbitter and Stefan Payne replacing Partington and O.Clarke. The breakthrough soon followed the substitutions and it meant so much more than Rovers just taking a step towards the second round. Bennett drifted in the box from the right flank, twisting and turning as he looked for an angle before firing the ball towards the back post, only for the long-awaited moment to follow, as Nichols cushioned the ball into the back of the net to end his prolonged goal drought – a wonderful moment followed as the striker was mobbed by his teammates and congratulated with solidarity from the Mem home end. The Bees responded well to going a goal down and put Rovers on the back foot, with Walker picking up a rebound with Smith on the deck but the stopper still got a strong hand to the ball leaving James Clarke able to clear off the line. However the visitors did find a way through minutes later to bring the game back level, with Dan Sweeney finding Robson in space inside the box, who lifted the ball calmly over Smith before it bounced inside the six-yard box and into the roof the net. Within moments of the equaliser the game was turned completely on its head as Barnet came from behind to lead, with substitute Dan Sparkes firing a cross/shot across goal that the poised Harrison was all too happy to tap into an empty net right in front of the travelling fans. After the goal, D.Clarke made his final change, with Tom Lockyer coming off the bench to replace Kelly. The predictable ensued as Rovers went all out for a second goal of their own, more or less camped in Barnet’s half with Leadbitter whipping in a series of crosses from the right, but credit to the North London side, they defended resiliently, armed with the entirety of their outfield options behind the ball. With six minutes of additional time offered to Rovers to source a way back into the game and as it so often does that one big chance did come as the ball pinballed in the area and dropped to Leadbitter, his strike was good but the sheer number of orange shirts meant it couldn’t find its way to goal as the Bees secured their place in the next round. Rovers XI: Adam Smith (GK), Joe Partington (Daniel Leadbitter, 59′), James Clarke, Tony Craig, Michael Kelly (Tom Lockyer, 79′), Ollie Clarke (c) (Stefan Payne, 59′), Liam Sercombe, Ed Upson, Alex Rodman, Kyle Bennett, Tom Nichols. Unused subs: Alexis Andre-Jr, Rollin Menayese, Chris Lines, Sam Matthews. Barnet XI: Mark Cousins (GK), Cheye Alexander, Elliott Johnson, Callum Reynolds, Craig Robson, Charlee Adams, Jack Taylor, Wesley Fonguck (Dan Sparkes, 73′), Dan Sweeney, Immanuelson Duku (Josh Walker, 35′), Mohamed Bettamer (Byron Harrison, 67′). Unused subs: Simeon Akin (GK), Shaq Coulthirst, Medy Elito, Ephron Mason-Clark.